With the temperatures expected to be in the high 70s yesterday, I headed out on another bicycle trek. I was rolling east from my home of Mukilteo by 10:30. It was already warm enough that wore shorts and a lightweight bike shirt. The first part of the ride was spent grinding through the busy city streets. It wasn’t long and I was in the woods and farmland countryside. The rolling hills ensured that I not only enjoyed the ride but also got a good workout in. While I was on Connely Road, I detoured at Bob Herman’s Wildlife Park at Thomas Eddy. 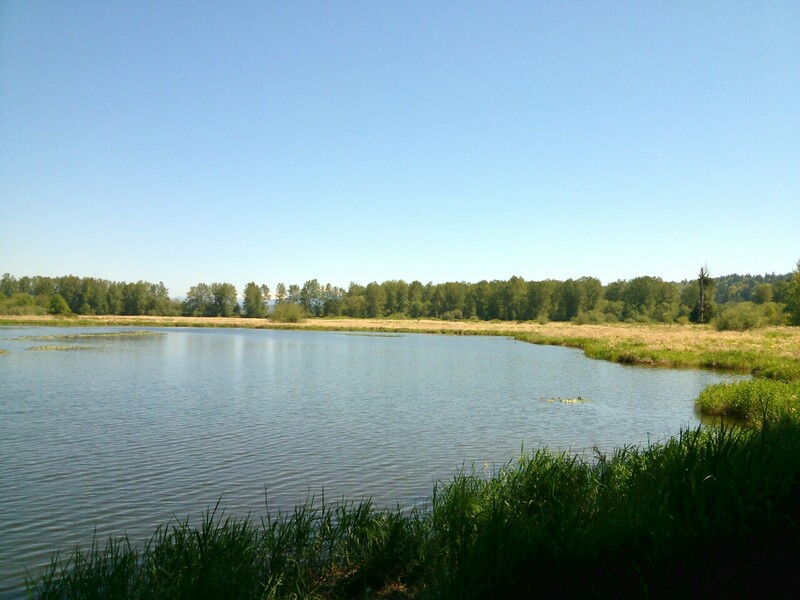 I rode down the steep gravel path which led to the trails of Shadow Lake and the Snohomish River bank. 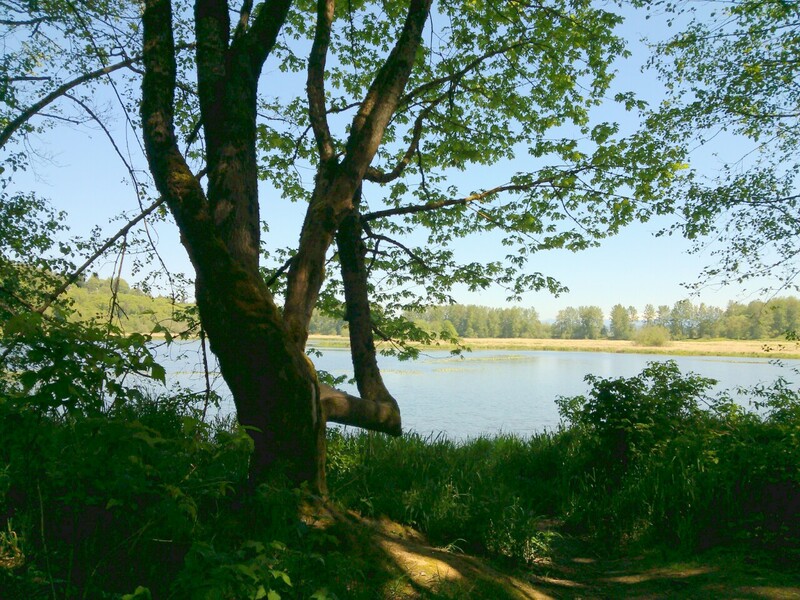 I took a dirt trail through a grove of Maple and Alder trees to the lakeside bank. A gentle breeze moved the leaves into a chorus accompanied by a few ducks on the lake. I could have been the only human being in the world as the only sound I heard was the music of nature around me. I rode up and out of the park and pushed on towards Monroe. I stopped briefly on Elliot Road to play hide and seek with a pair of geese. 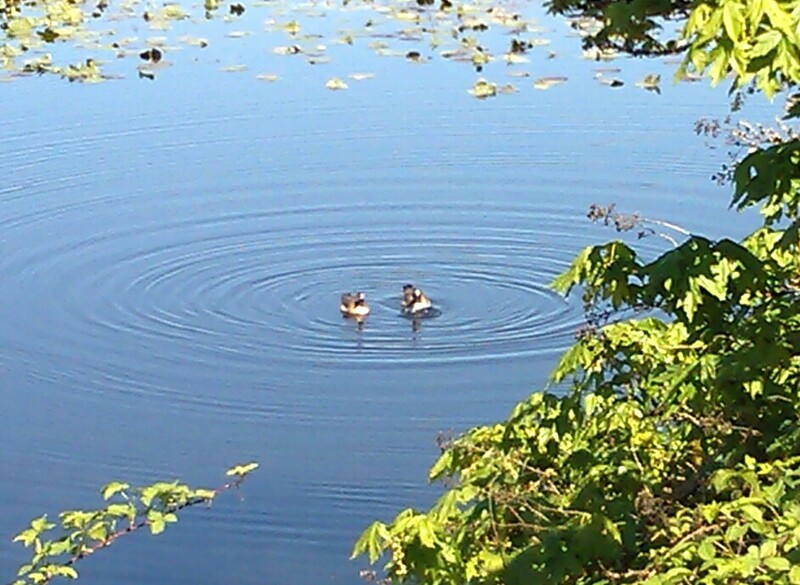 They were in a roadside pond and appeared to be camera-shy. I used some old SWAT sniper skills to sneak a camera shot of them. My antics attracted the attention of another cyclist who stopped to chat with me. After we shared a couple of cycling adventure stories we headed out in opposite directions. I moved on down the road enjoying the sights along the way. The temperature was over 80 degrees by now. It was only when I stopped that I really noticed the heat. Traffic was very light which made the ride even more enjoyable. 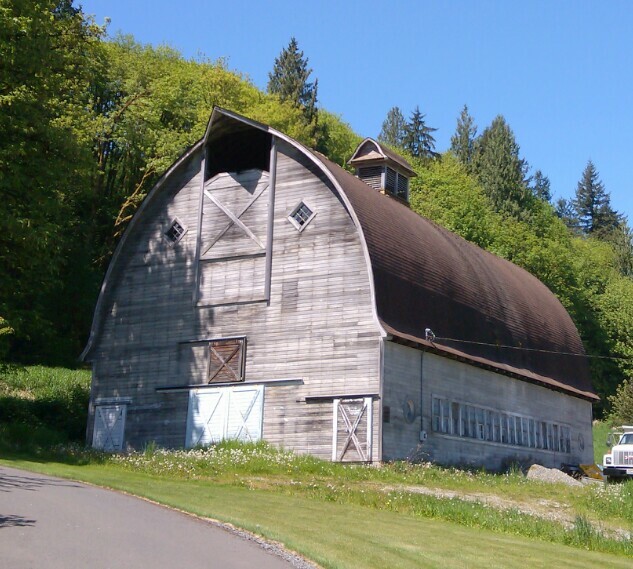 I stopped to take a photo of one of the many old barns that decorate the countryside. I took the High Bridge Road over the Snohomish River and was soon in Monroe. Early pioneers began to settle in this area in 1860. They found it very suitable for farming and logging. 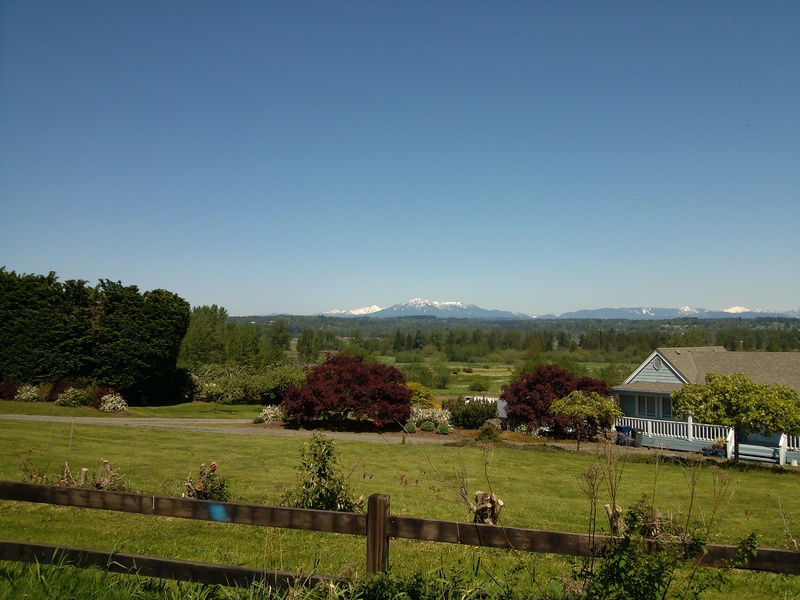 I stayed to the south side of town and took the Old Snohomish-Monroe Road. 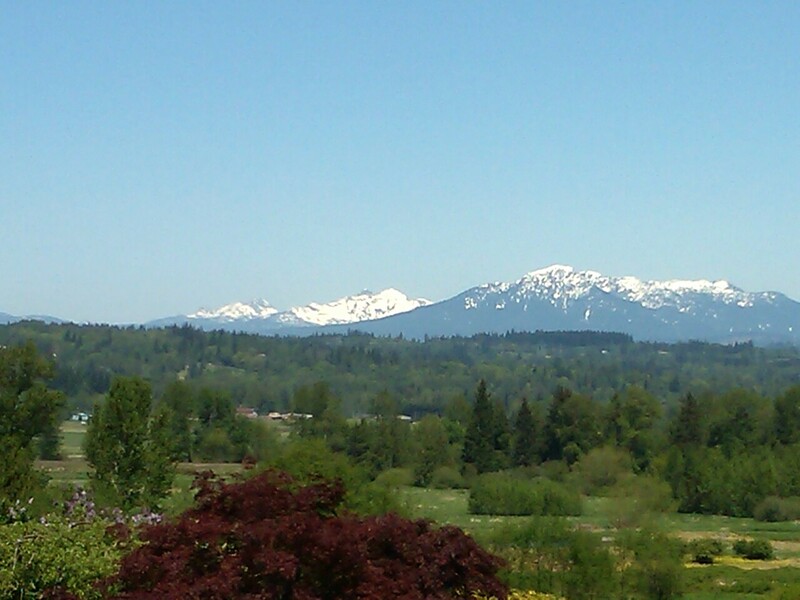 I had an incredible view of the snow-capped Cascade Mountains as I rode through this area. 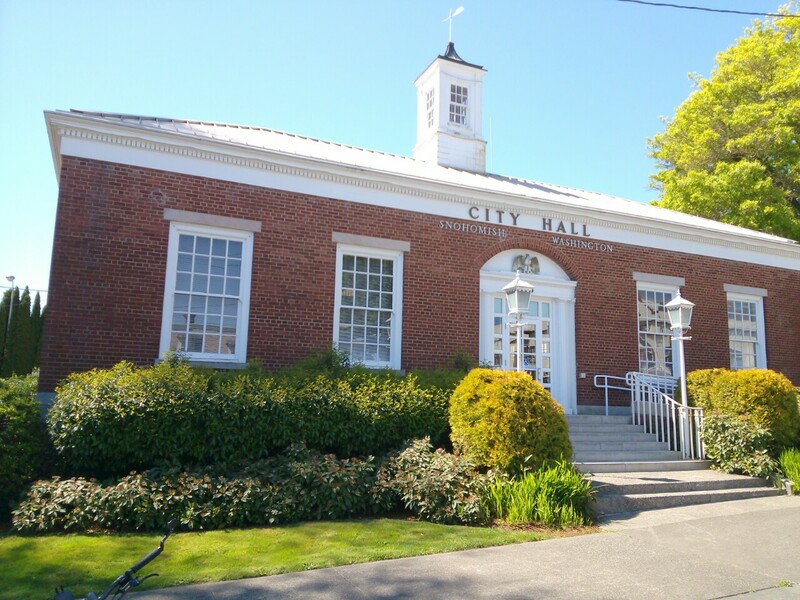 I worked my way through the valley to the city of Snohomish. After a stop to photograph the old City Hall building I continued my journey. I crossed back over the Snohomish River and took the Lowell River Road towards home. I looked over to the river and saw a harbor seal doing a backstroke on the water’s surface. For those of you not so familiar with this area, it is many miles inland from the salt water of Possession Sound. Apparently this fella was hoping to get first dibs on the salmon in the river. I stopped by my office in Everett before taking on the last 10 miles of the day. I put another 55 miles on the bike this day and am a little closer to getting into Pike’s Peak climbing shape. This entry was posted in Bicycling, Mountains, Photography, Snohomish, Washington State. Bookmark the permalink. Great post. We shared your ride with the 150 women who are beginning and ending their long miles here in Snohomish. Truly inspiring! Ha! They’ll all be on First Street ready to tackle a century!